Eased is simplicity at its finest. Think of it as a rounded square - defined without the rough corners. Great for tight spaces and narrow walkways, an eased edge is perfect for small kitchens, backsplashes or bathrooms. It is easy to clean, and it's ideal if you don’t want to draw attention away from backsplashes or a dramatic faucet. If you value a very Roman Renaissance elegance, then ogee is the way to go. It is very popular for natural stone countertops such as marble, but it can also be achieved on laminate. It is distinguishable by its “S” shape and can be found in more traditional designs. As it tends to add depth, it’s best suited for larger spaces. Universally flattering for virtually any kitchen, a full bullnose edge is a popular option for both traditional and contemporary designs. It is curved on the top and bottom for a round, even finish. The soft edge has an elegant, sophisticated touch that is safe for kids. Bonus: it’s easy to clean! A demi-bullnose edge is very similar to a full bullnose, except that it is rounded at the top and flat on the bottom. It works well for all cooking spaces and adds a curve to the room, which gives an overall warmer look. Used in more contemporary designs, a beveled edge is distinguishable by its sharp 45-degree angle. The cut makes for a well-defined border that forms the countertop while adding a subtle, sleek look. Like a toddler, a mitered edge is dramatic. It is best used if you want your countertop to be the focal point of the room. The look gives the impression of a very thick slab without the extra expense of a solid slab. Modern designs work best with this profile, so be edgy! Half-round and eased edges get mixed up frequently. They are very similar, but an eased edge is more square-like, and the half-round is, well, more rounded. This profile gives a nice, smooth finish. Whether you’re cooking in the kitchen or brushing your teeth in the bathroom, this counter option is very comfortable to work up against. Want to feel more connected to nature and its natural elements (e.g., natural stone)? Then chiseled is calling your name! Historically, masons worked with natural stone to create unique accent pieces. This artistic option offers a rustic and unique aesthetic with a hand-dressed appearance. A laminated edge involves making your countertop appear thicker by gluing additional stone underneath your countertop. Usually, the reasoning for this is to hide the supporting plywood underneath. Although there is a seam where the edge is, it usually goes unnoticed. We offer both laminated eased and full-bullnose edges, both of which are commonly used on free-standing kitchen islands as an accent piece. 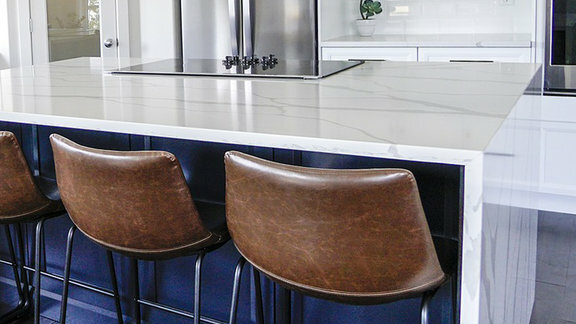 Now, you’re probably standing on the edge of reason (literally) trying to figure out which countertop profile is best for you. Don’t worry; we’re here to help! Visit our showroom today to discover which style best fits your wants and needs.